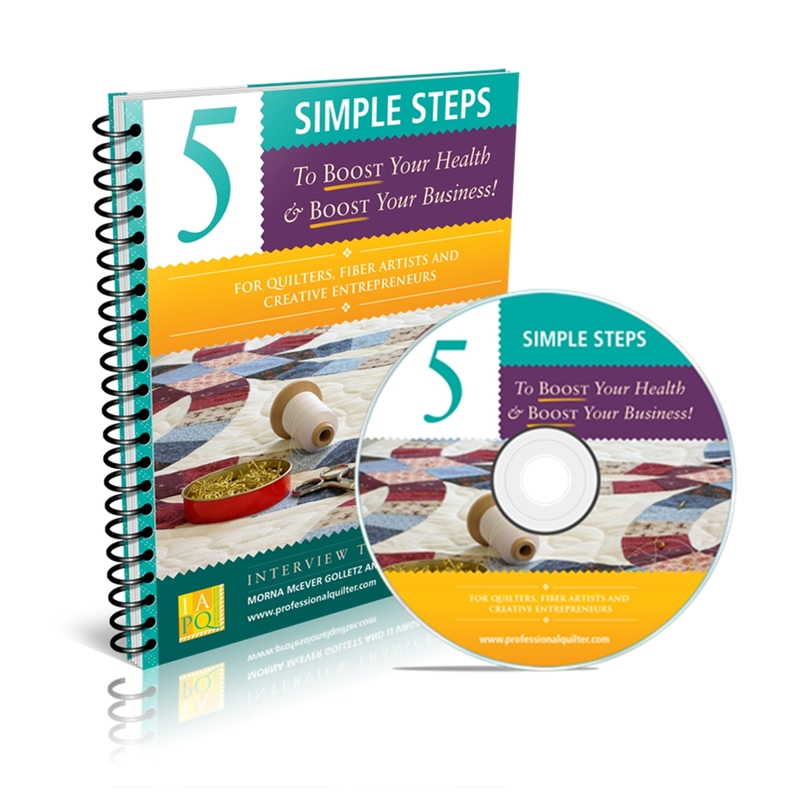 The CD of the hour teleclass that Morna and JJ held called "Five Simple Steps to Lose Fat and Boost Your Business." The Audio transcript of the teleclass so you can go back and look up something quickly. Plus we've left space for your notes. Bonus #2: a link to Morna's favorite exercise and food diary. Change your lifestyle and your health and watch your business grow. Morna had one of her best years after following JJ's plan. The cost is the program is tiny compared to spiraling costs of living with ill health and a declining business. The dedicated quilter buys 93.6 yards of fabric a year at $9.90 per yard. Isn't your health — personal and business — worth seven yards of fabric? IAPQ Members Save 50% - See Members Page for Code. Not a member, join today. Not sure you are ready to invest in your health and business? 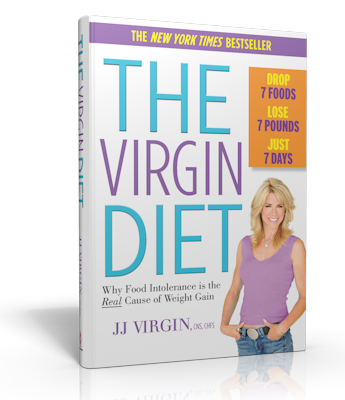 The Virgin Diet: Why Food Intollerance is the Real Cause of Weight Gain. * Unfortunately, products purchased via Amazon are excluded from discount offers. Website Banner Ad. Appears on all site pages in the right sidebar except the blog. Size is 300 by 150 pixels. One Month Rate. Website Banner Ad. Appears on all site pages in the right sidebar except the blog. Three month duration. Size is 300 by 150 pixels. If you're contemplating becoming a judge or simply want to know more about the judging process, you'll want to have this unique collection of three informational resources (includes PDF downloads and an MP3 download). Not currently available in EU. Designed as a workshop notebook, this book covers the philosophy of judging, sponsor responsibilities, the actual judging process and critical judgment. Included are 14 ranking systems, a form for judging masterpiece quilts and a forum discussion among professional quiltmakers on judging. Published 1990. Available as a downloadable PDF. Not available in EU. This collection features 19 critical essays on judging written by NQA Judge and Master Judge Katy Christopherson for The Professional Quilter. Available as a downloadable PDF. Not availalbe in EU. Geared to the bookkeeping novice, this book covers simple cash method, double entry system, setting up accounts and IRS expense categories. Examples are from real-life quilt businesses. Practice worksheets are included. Published 1990. Not available in EU. Written by Bernard Kamoroff, CPA, and now in its 26th edition, Small Time Operator is filled with the nuts and bolts of turning your idea, hobby, skill or trade into a successful business of your own. It covers permits and licenses; financing your business; finding the right location; creating and using a business plan; choosing and protecting your business name; whether or not you should incorporate; a complete and simple bookkeeping system; hiring employees; federal, state and local taxes; buying a business or franchise; dealing with - and avoiding -the IRS, insurance; contracts; pricing; trademarks; and more. Published 2005. Includes current Update Sheet. 224 pages. Designed as a workshop notebook, this book covers what to teach, where to teach, instructional methods, lesson plans, course outlines, teaching adults, teaching special students and handling difficult situations. Includes a section on professionalism, ethics and standards. Published 1990. Available as a downloadable pdf. Not available in EU. Author James Dillehay offers step-by-step help to writing a winning grant proposal. Learn how to locate grant programs that give to projects like yours, understand their application guidelines and submit a proposal. Book lists more than 1,000 foundation, corporate and government grant givers, craft artist in residency programs, craft and art in public places, money for foreign studies and more. Published 2007. Professional Profile: Val Schlake: Creating Longarm Connections. On Creativity: Five Ways to Nurture Your Creative Energy. Technology Forum: Answers to Frequently Asked Questions. Professional Profile: Annalee Waite: Crossing Boundaries. Studio Tour with Artist Liz Kettle. Your Health + Your Business: Learn to Tame Your Sugar Addiction. Longarm Forum: Finding Business as a New Longarmer. Studio Tour with Artist Chris Boersma Smith. Studio Tour with Artist Lynn Krawczyk. Professional Profile: Humming Along the Highway with Joan Ford. Studio Tour with Artist Kathy Wylie. Financial Focus: Advertising That Works for You. Technology Forum: Looking for Some Privacy? Professional Profile: The Swirly Girls: Branding Fun. Studio Tour with Longarmer Marlene Oddie. Financial Focus: Inventory The Elephant in the Room. Technology Forum: What the Heck Do I Blog About? Professional Profile: Andrea Funk: Bucking the Rules. Financial Focus: Make it Happen! On Judging: Categories and Trends. Technology Forum: Wisdom and Insight through Self-Publishing. Financial Focus: Your Crystal Ball: Cash Flow. Technology Forum: Documenting Your Quilt Journey in Print. Professional Profile: Celine Perkins: Boasting a Can-Do Attitude. Financial Focus: The Right Profit & Loss Statement for You. Technology Forum: Pinterest: Picures and Promotions. Professional Profile: Teacher of the Year: Pamela Allen; Meet Our 2012 Nominees: Sue Benner, Elsie Campbell, Judy Coates Perez, Ellen Anne Eddy, John Flynn, Diane Gaudynski, Shirley Higginbotham, DeLoa Jones, Mary Pal, Larkin Van Horn, Venessa Wilson, and Joen Wolfrom; Studio Tour With Texas professional machine quilter Michelle Kitto; Financial Focus: Two Monthly Reports You Should Use; Longarm Forum: Dealing With Competition; Technology Forum: Pinterest, Part 1. Professional Profile: Playing All the Angles With Margaret Miller; Studio Tour With Quilter Margo Coates; "Sacred Threads" Renaissance; Longarm Forum: How Much Should You Charge? ; Technology Forum: Teaching Online, Part 2.